The Falcon 2000 multi-role maritime reconnaissance aircraft is developed for naval and coast guard missions. Image courtesy of Dassault Aviation – DR.
A Falcon 2000 MRA model was displayed at the Euronaval 2014 exhibition held in Paris, France. Image courtesy of Dassault Aviation - E. Gauchet. The Falcon 2000 reconnaissance aircraft can be equipped with air-to-surface missiles for anti-surface warfare missions. Image courtesy of Dassault Aviation - E. Gauchet. The Falcon 2000 MRA is powered by two Pratt & Whitney Canada PW308C turbofan engines. Image courtesy of Dassault Aviation - E. Gauchet. Dassault Aviation developed the Falcon 2000 multi-role maritime reconnaissance aircraft (MRA) based on the Falcon 2000 LXS business jet, to meet the operational needs of naval and coastguard forces. The Falcon 2000 MRA can be configured for a variety of missions including maritime reconnaissance, search and rescue (SAR), intelligence, surveillance and reconnaissance (ISR), anti-surface warfare (AsuW) / electronic warfare, reconnaissance and over-the-horizon targeting (OTHT), electronic intelligence (ELINT), law enforcement, piracy control, fishery patrol, drug interdiction, personnel and light equipment transportation, environment protection and medical evacuation. "The mid-sized Falcon 2000 maritime reconnaissance jet features aerodynamic configuration and sturdy airframe structure, providing fast and safe operations in overseas and remote airfields." The maritime reconnaissance version was originally developed for the French Navy’s AVSIMAR project. 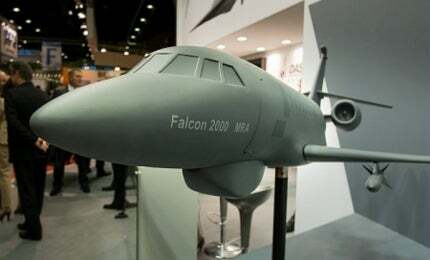 South Korea announced plans to purchase two Falcon 2000 MRAs in December 2011. In April 2015, Dassault Aviation was selected by the Japan Coast Guard (JCG) through an international competition to provide an undisclosed number of Falcon 2000 maritime surveillance aircraft. Its partners involved in the development of the aircraft include L-3 Platform Integration and Thales. The mid-sized Falcon 2000 maritime reconnaissance jet features aerodynamic configuration and sturdy airframe structure, providing fast and safe operations in overseas and remote airfields. It is equipped with four cutting-edge slats and winglets. It requires minimum maintenance costs and can be operated from forward-operating bases. The MRA has an overall length of 20.23m, height of 7.06m and wingspan of 21.38m. It has a maximum take-off weight of 19,414kg, a maximum landing weight of 17,827kg, and a fuel capacity of 7,530kg. Its maximum ramp and basic operating weights are 19,505kg and 10,698kg respectively. It features a 7.98m-long, 1.88m-high and 2.34m-wide cabin that has a volume of 29m³ and allows for carriage of significant payloads. The aircraft is fitted with observation windows, an emergency exit door, and a life raft / marker launcher. In basic configuration, it accommodates a flight crew of two members and two mission system operators / observers, while in enhanced configuration carries four operators / observers, in addition to a two-man crew. The Falcon 2000 MRA has underwing store stations for carrying a wide variety of weapons such as air-to-surface missiles, target towing equipment, electronic warfare and simulation pods. Dassault Aviation’s enhanced Avionics System (EASy II) cockpit installed in the Falcon 2000 maritime reconnaissance jet reduces the crew workload and enhances the situational awareness. The flight deck features co-ordinated heads-up / heads-down display technology and enhanced take-off and go-around capability. It can be optionally fitted with a synthetic vision system. The first Ocean Eagle 43 trimaran ocean patrol vessel ordered by the Mozambican Government was launched in January 2015. The navigation systems include RNP/SAAAR, WAAS-LPV GPS guidance, automatic descent mode, XM Weather integrated with INAV map and automatic dependant surveillance-broadcast (ADS-B) out, and a runway awareness and advisory system. An onboard state-of-the-art mission system increases the Falcon 2000 MRA’s mission capabilities and reduces operator workload through automatic analysis functions and analysis processes. The aircraft’s basic configuration is equipped with multi-function workstations with colour displays and a complete communications suite, which includes satellite communications (SATCOM), a 360°, FLIR retractable electro-optic turret and a long-range multi mode air-to-surface radar operating in dedicated air-to-sea modes. The Falcon 2000 maritime reconnaissance aircraft is powered by two Pratt & Whitney Canada PW308C turbofan engines, which each develop a thrust of 31.14kN. The Talon II combustors used in the engines reduce nitrogen oxides (NOx) emissions and improve engine performance. The engines are controlled by a dual-channel, full-authority digital electronic control (FADEC) system. The propulsion system provides a maximum operating speed of Mach 0.86 and a range of 7,410km. The aircraft can reach a maximum operating altitude of 14,325m. Its take-off and landing distances are 1,425m and 689m respectively. The MRA is capable of operating at high-altitudes under difficult weather conditions, with just one operational engine.